"Our elections are the envy of the world." Every now and then, I watch all the episodes of my favorite continuing character TV series. It's an iconic vision from the 1960s. There are seventeen episodes, an hour each. 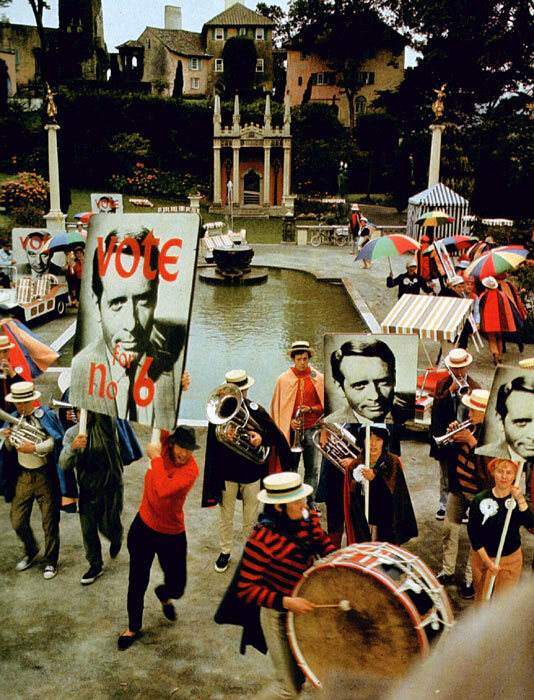 I refer, of course, to the greatest cult television show of all time, Patrick McGoohan's The Prisoner. It wasn't only different from other shows. It stood in opposition to other shows, including the wrongheaded attempt at a remake. We all know the premise. Secret agent (where have we heard those words before?) resigns and is given knockout gas to begin his retirement package. He wakes up in a science fiction series. The Village is more than a self-contained community on an island, where ex-spies and other important government types are brainwashed and worked over. It's so high-tech, so insanely advanced, that we know this is a dystopian vision of the future. The technology necessary to create the flexible robot spheres, the Rovers who won't let anyone escape the island, suggests powers on the part of the Village that cannot be resisted. The whole point of the story is that McGoohan never stops resisting. Every week, there is a new Number Two—with the exception of the great character actor, Leo McKern who is given a second chance. Only problem is that he is the one who breaks. No wonder there was such turnover among Number Twos. We never see Number One until the last episode, at which point we enter a metaphysical fantasy land of symbol and archetype. Patrick McGoohan's character is Number Six. He never tires of telling Number Two (and us) that he's not a number but a free man. We are so impressed at this that we sometimes forget that his number is six!!!! That means Number Six is too near the top to be treated like a lesser "citizen" of the Village. No crude methods of persuasion for him. The information in his head is too important to just throw him away with interrogation techniques that have come back into vogue. One of the episodes is "Free For All." McGoohan directed his own script for this one. It's about voting. Number Six runs for office against Number Two. Anyone seeing this episode as their first introduction to the series might be confused. How can a Totalitarian system have elections? There is no better answer than to watch the episode. Meanwhile, leaving this British TV series back in the lost era of the 1960s, let's return to the Land of the Free and the Home of the Brave in the Fabulous 21st Century. I live in Florida now. Before that, I lived in California. Before that, I lived in Georgia. I've lived in various places across the fruited plane, but I grew up in Florida. Feel at home in this state. That was until I received the item in the mailbox that accompanies this little article. If you haven't read what's in that yellow box, now is a good time. Since taking up residence here, I've registered to vote. I choose to vote sometimes. I choose not to vote sometimes. My first vote since moving back here was for Ron Paul in a primary. Readers of the publisher's statement in Mondo Cult 3 may remember that I said as much in print. My last chance to vote in the recent November event was on a Tuesday we will not forget soon. What seemed to be a piece of junk mail (with a yellow box) arrived in the mail by the weekend. Having not availed myself of early voting, I received this FINAL WARNING from Citizens for a Better Florida, Inc. It's a long piece of paper with information on previous voting information about people on my street. We all had the honor of receiving this in what I will call the Neighborhood. Those of my neighbors who care about how I vote already know, anyway. The others mind their own business, as I do in return. I had told those with whom I discuss politics that I would probably not vote this time, but was wavering on some specific proposals, just so long as I wouldn't have to vote for an actual human being. To say that I was unimpressed with the candidates is an understatement. Reading the piece of threat-mail was enough to make up my mind. Rarely have I felt that I was living in the Village more than from this petty harassment. But I must admit that much nonsense has been happening all over the country since 9-11. This is just one more thing. I intend to give up voting until some semblance of privacy is restored. As for the excuse of public record, the best thing to do with that is simply ignore it. I choose to vote, or not to vote, for the same reason. It's called free will. When I do not vote, it isn't because of apathy. I am a libertarian. If I find a tactical advantage in a vote for a third party, or even one of the major parties, I'll play the statist game. If nothing looks good on the menu, I can always go with the option of principled non-voting. The most important thing is that I won't be intimidated into voting. Giving into something like that means surrendering to the Village. How often has someone told you that if you don't vote, you have no right to complain? That's not what it says in the First Amendment. You have free speech, whether you vote or not. Both parties spew out the same cliches through their irritating spokes-creatures. One of the most annoying is when they solemnly intone, "Don't let the perfect be the enemy of the good." The implication is that the parties are capable of producing good. We might as well say, "Don't let the horrible be the enemy of the terrible." The chance of your vote tipping the scales, not in terms of an election (however unlikely), but in terms of results you actually want to happen, is mathematically beyond the powers of a Star Trek computer to work out, right before it blows up. It is true that many have bled and died for the right to vote. We can only wish that their sacrifice had led to happier results. As for taking Mondo space to share my views, I've always tried to restrict political controversy in media commentary to what I can actually tie to genre subjects. Think I did that just now. Letter writers who didn't like my views appearing in Famous Monsters or Cult Movies or Filmfax or Worldly Remains (to name some prominent examples) never denied I was at least talking about movies and books and TV while I vented. There were even letter writers who approved. Let's all be grateful that I don't blog. To wrap up this non-blog (merely a blob of thought), I honor The Prisoner again. Accused of having no values, Number Six answers, "Different values." He is an individualist. He doesn't seem to care about the collective. An insult thrown at him is that he is "unmutual." That is a terrible pejorative in the Village. It's also a badge of honor superior to one of those "I Voted" stickers.